Making the switch from easy, convenient, portable teabags to flavorful, nuanced loose leaf tea can be daunting, even if you are aware of the quality disparity between most teabags and whole-leaf tea. With a basic understanding of how to brew whole-leaf or loose-leaf tea and an simple infusion method, the switch is easy. Here are five easy ways you can infuse tea at home, on the go, at the office and beyond. If you want your tea brewing to be as easy as “just add (hot) water,” you can still enjoy whole leaf tea. More and more companies are offering their full-leaf teas packaged into pyramid bags (pyramid-shaped bags) and tea pouches or ”tea socks” (basically plus-sized teabags made of cloth or paper-type materials), which allow for fuller infusions than traditional teabags. Likewise, some companies are launching lines of upscale teabags with higher grades of tea leaves than traditional teabags. They’re not whole-leaf, but they’re better than your average teabag. Tea balls are classic and easy enough to use, but they are flawed. Cheap tea balls tend to fall apart after a short period of use. Invest a little extra in a good quality tea ball, teastick, or similar tea strainer instead of the dollar store varieties. In a similar vein, you can also make your own tea pouches or “tea socks” at home. They’re basically teabags you fill yourself, so you can select the type, flavor, and quality level that’s right for you. Note: Don’t fill them up all the way or tie them shut too tightly! It keeps the tea from unfurling as it infuses, negating much of the point of selecting whole-leaf tea over teabags from the grocery store. With a little practice, gaiwan tea infusers are an easy, portable way to drink tea anywhere, anytime. Gaiwan sets usually consist of two to four parts: a cup, a lid, a saucer (optional) and an extra cup (optional). 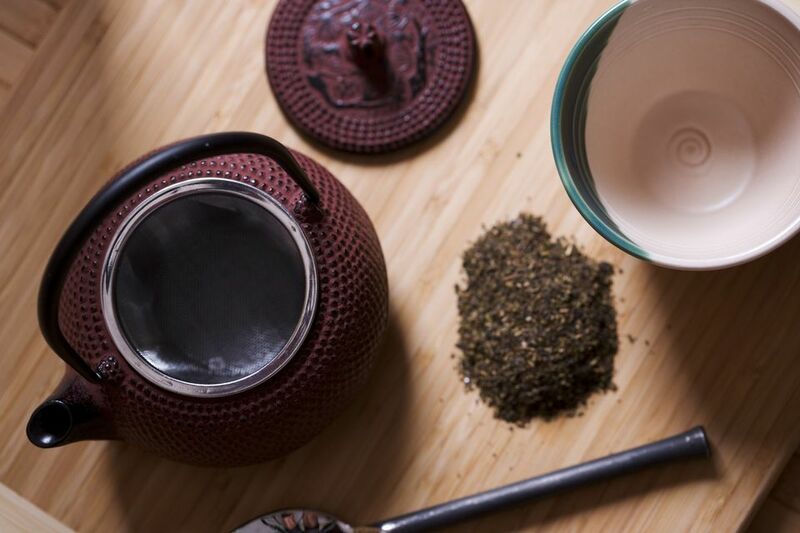 The easiest way to brew with a gaiwan is to add tea leaves and water, brew the tea, and then use the lid (tilted at a slight angle on top of the cup) to strain the tea as you pour it into a cup. With your right hand, lift the cup, lid, and saucer. Using your left hand, hold the lid at a slight downward angle on top of the cup. Alternately, you can skip using the saucer and just lift the cup and lid with one hand. Sip from the cup, using the lid to strain the tea leaves. With this method, you can also pour sips of tea into the lid to cool it down quickly or share it with others. If you’re brewing full-leaf tea from teabags, check out the Mighty Leaf Tea Top Brew Mug or just use a quality Thermos-style container. Otherwise, there are a few good options for loose-leaf tea brewing on the go. The Bodum Travel Press works like a regular French press and is a good option, too. Other infusers tend to require that you remove the leaves when you’re done brewing. If that doesn’t bother you, then one of those brewers may be for you. The best ones are made from durable, non-leaching plastics (and/or flavor neutral metals) and have lids that double as drip trays (trays for the infusing basket to rest on when you’re done brewing).